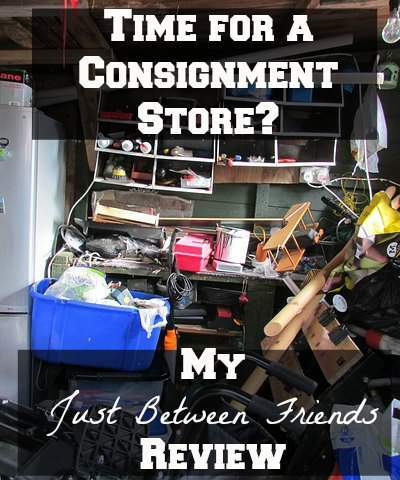 A consignment store can make money without as much work as a garage sale. Consignment store. The phrase makes me think of goodwill. I will be honest, I have never had much luck with selling at a consignment store. I've tried Twice as Nice (they buy, but tend to give me less than $1 each item and only buy about 10% of them). I think the buying 10% is just something they do because I can bring in a great box or an okay box and really it tends to be the same. That is the problem with a consignment store. Lots of stuff to buy, and it is hard to move it out the door that quickly. I've sold at a consignment store with Apple in the name… can't remember what it was called. I've sold at a mom and pop consignment store that started out as a craft store, but quickly became a consignment store. You could rent a booth and sell your own products or you could put them on consignment. The best consignment store was Half Price Books. They at least gave you a decent amount for what you were selling. In every case, you get a little, which is nice, but it is never a lot. I tend to spend more while I am in the store (another problem). I am rehashing this previous reader question because of a follow-up question brought to me on twitter. We have owned our Nest Thermostat for over a year now so I was able to go through our old bills and tell you exactly how much money the Nest thermostat has saved us. We had a programmable thermostat before purchasing The Nest so any additional savings is not due to switching to a programmable thermostat (it is due to switching to a learning one). There is also the unfortunate fact that most people do not know how to use a programmable thermostat. Despite the fact that a programmable thermostat saves so much money, only about 30% of American households install a programmable thermostat. Of that 30%, only 47% of those are in the “program” mode (you can use a programmable thermostat like a regular one if you keep it out of the program mode). This programmable thermostat study from 2010 goes through the problems with a programmable thermostat. A learning thermostat solves those problems. If you would rather use a programmable thermostat then this excellent post at House Logic: Programmable Thermostat goes through how you should program it to save you the most money. 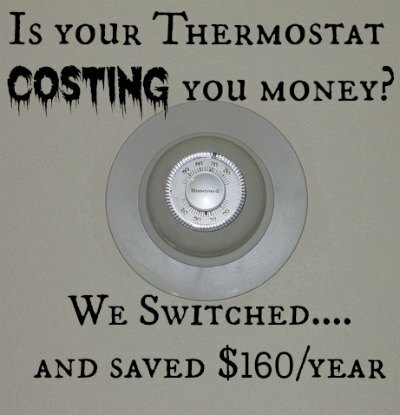 A programmable thermostat will save you a lot of money on heating and cooling your home. When we moved into this home we wanted to install a better programmable thermostat and we decided to install Nest Thermostat. Our old programmable thermostat was a typical M-F/SS programmable thermostat (you can set a different schedule for those two options). Those do not work well for us because my husband works through the weekend and has two weekdays off. That means our schedule is not the same throughout the week. 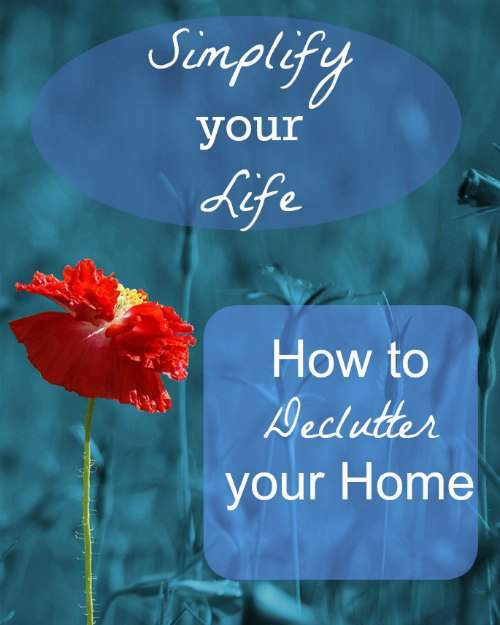 Decluttering in new year, that means it is time for my second favorite challenge of the year (second to Homesteading on a Dime only because that challenge makes me money and this one makes me clean). Despite “making me clean”, decluttering does have it's benefits. I feel so much better in a minimalist home. I love knowing where everything is and no longer having that brief moment of anger when I found something I love hidden behind four things I don't. There is more to living a minimalistic life than decluttering. I still have a LONG way to go before I will be happy with the amount of clutter we own. But, each year I take steps toward getting our “stuff” less and less. The mimimalists say it best: “decluttering alone doesn’t solve the problem; discussing how to get rid of your stuff answers only the what, but not the why“. So, why do I declutter? 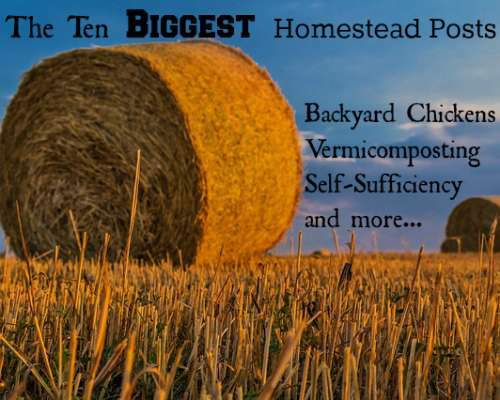 Discover some of the Best Homesteading Blogs! Homesteading blogs it is time to shine! I love the weekly HomeAcre Blog Hop! I love seeing the homesteading, homeschooling, garden, organizing, and all the other homesteading blogs posts from the week. This week at Pint Size Farm , we just finished up Homesteading on a Dime challenge directions. If you haven't started yet don't worry! It is a go at your own pace kind of thing. Start at the beginning and move on as you get the ten minute activities down. Ten minutes a day is the important part – the extra time you spend is up to you. The decluttering challenge starts this week. I also have a fun Valentine's Day craft that will work well in your garden and is simple enough to do with your kiddos. I'm hoping to also have a review and giveaway of Valley Food at the beginning of next week. All the homesteading blogs submitted wonderful posts last week. I can't wait to see what we have for this week. How did you do in the homestead on a dime challenge this month? Cheap living, I believe the frugal life is best accomplished by both living frugally and making money where you can. 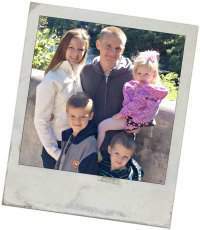 I especially like passive income streams and setting long-term money making goals, like in the homestead on a dime challenge. 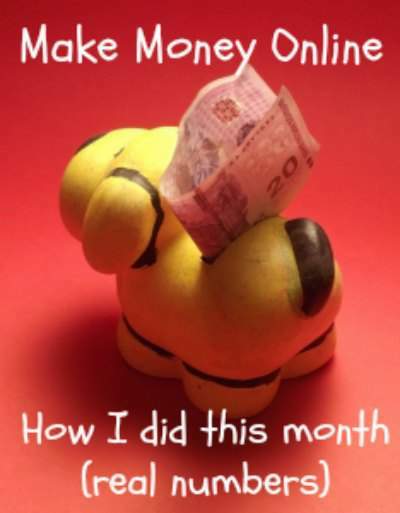 I challenged you to earn an extra $600-$1800 extra this year by spending 10-60 minutes a day making money online. How are you doing so far? I had a pretty good January, which is great because I didn't actually start the challenge until January 15th. Cheap living is especially fun if you have extra money to spend on things that you might want more than need. And, as lifehacker says, cheap living means you will get out of debt that much faster! Remember, think long-term goals. Earning a few dollars a day might seem like nothing, cheap living or not, but it all adds up. What will you do with an extra $1500 at the end of the year? Most of the sites have options between checks, paypal, and gift cards. I like checks, but I love gift cards. If you go with Amazon gift cards then you can save them in your account until you want to spend them. Nothing beats watching that balance grow until you get something expensive you really wanted. Remember, long-term goals! 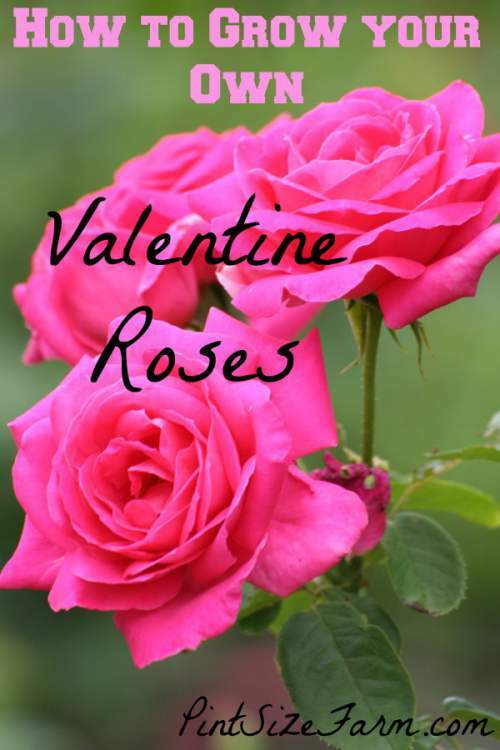 Grow your own Valentine Roses for a personal, but classic gift. Valentine roses are one of the most common (and sweetest) Valentine Day gift. If you want to go one step further in your gift of love then you should go with homegrown Valentine roses. Nothing says “I Love You” more than giving a gift that both symbolizes love and is something you created with your own two hands. Red roses – Red roses mean love and desire. They are the most common valentine roses. A dozen red roses means “I Love You”. Yellow roses – Yellow roses mean friendship and caring. If you would like to give a friend valentine roses then yellow is the way to go. Pink roses – Pink roses signify joy and admiration. They are also a mix between red and white so they are a great option for a relatively new relationship that hasn't made the jump into “love” yet. Purple roses – Purple roses signify enchantment. A purple (or pink) rose is great for somebody you would like to go out with. Orange roses – Orange roses are rare, but if you can find them it signifies passion. If you are in a new relationship then a mixed color rose bouquet conveys the feeling of love without a specific meaning.